Could you provide more details about what you mean? What part of the "incremental load" isn't being done? Since these components make use of SQL Server CDC, you should make sure that it is correctly configured. You might want to run queries directly against the CDC tables to make sure that change rows are being picked up. There are steps to follow in Books Online – http://msdn.microsoft.com/en-us/library/bb522489…. Like Uzzie, I too am having the same incremental load issue. The initial load works fine, but when I run the incremental load, nothing gets picked up. I checked the value stored in the cdc_state table and the lsn and timestamp values don't seem to correspond to the lsn or timestamp in the cdc.lsn_time_mapping table. The lsn in the cdc_table also do not correspond to the lsn in the cdc table of the cdc enable table. For example (using numbers instead of lsn to illustrate), the last "lsn" in the cdc table would be 10001, but the "lsn" in the cdc_state table would be 20001. So when I do an update, the new "lsn" capture would be 10002, so when I run the incremental load, the range starts with 20001 which doesn't include the "lsn" of the most recent update. I hope I'm explaining it clearly. Thanks. Does this work "change tracking" also? No – this feature only works with Change Data Capture. Change Tracking is a synchronous event (i.e. you have to deal with the change as it happens) – you don't usually integrate CT with an ETL process directly. 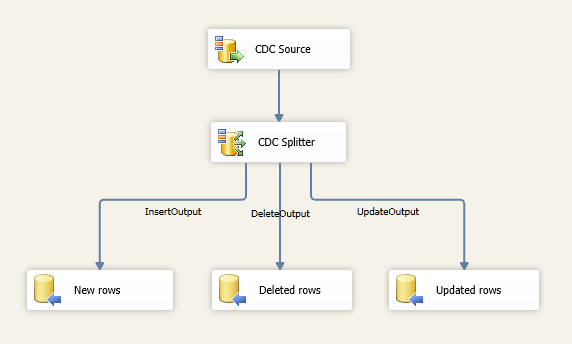 Instead, you'd redirect the changes to a separate table, and read them with an SSIS data flow later on. CT doesn't give you the same level of tracking or flexibility that CDC provides (but it can be a much lighter weight process). The CDC components come with a windows service that you'll use to configure CDC against Oracle. 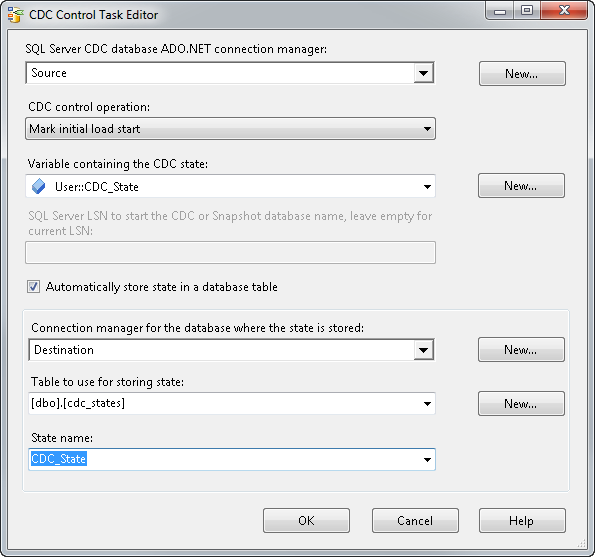 As part of the configuration, the service will setup some empty CDC tables in a SQL Server instance to mimic your Oracle data. 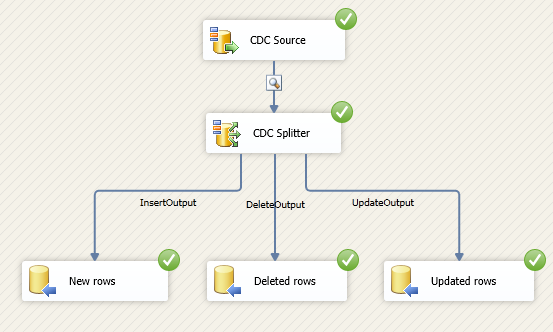 When you configure CDC in SSIS, you'll point the components at the SQL instance (this essentially tricks SSIS into thinking it's talking to SQL Server, and not Oracle… by using the same CDC tables/API, we can keep the functionality in sync). I'm working on getting some posts about CDC with Oracle. Any more updates or posts on using CDC with Oracle? Is there any posts on how to setup this with oracle I have been strugling with it for some time and begging to pull my hair out. ! If anyone has any articles on this it would be much appreciated as I can setup the first steps fine and have the tables but must be doing something wrong with the flow controls. Great. I will try to find the service and play around. Do you have any links or blogs that I can go to for Oracle CDC? I have everything setup and its seems to be working properly but I am not seeing any data landing in the cdc mirror tables. I am making changes in Oracle and I can see the 'Status' move from IDLE to PROCESSING but I am not seeing any changed data. I know what the issue is. If the table is partitioned in Oracle it does not work. If I recreate the table as a non partitioned table it works. Maybe there is something else I need to do for a partitioned table but just FYI for everyone. It may be because the update sql is slightly off. At least that was true for me and my copy of AW. Yes, you would need to create separate state variables / state names. You can see what makes up the state value (it's just a string) here: http://msdn.microsoft.com/en-us/library/hh758667…. Although note, I believe we have a content bug about the current Books Online entry… we're working on getting it updated. Doesn't look like an SSIS issue, there. Searching around for error 18805 I found this KB – http://support.microsoft.com/kb/2655789. If that doesn't help you, you might want to contact customer support. Does the CDC Oracle connectivity work backwards and track changes in SQL, and then write them to Oracle? Your SSIS package can write the changes anywhere. You'd use the CDC components to detect/read the change, and then use the Oracle Destination to write them to Oracle. You can find the 2012 Oracle connectors here. 3. Run your incremental CDC package to pick up the new column values. 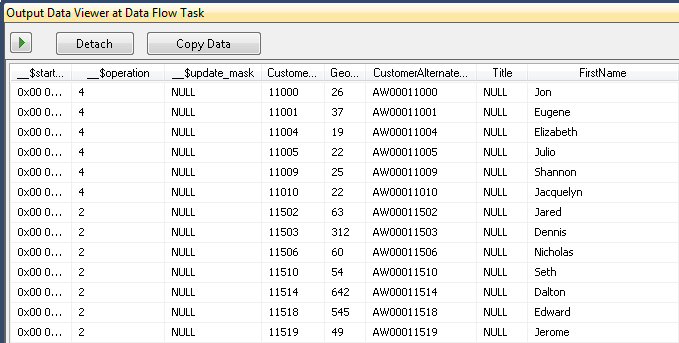 If you insert the new values before you update your CDC capture/SSIS package, then you'd need to use another way to get all of the data over (since those column changes wouldn't be picked up by CDC). Resetting your CDC process and running another full load would do it, but you could also script something out that just moves the values for the new column. 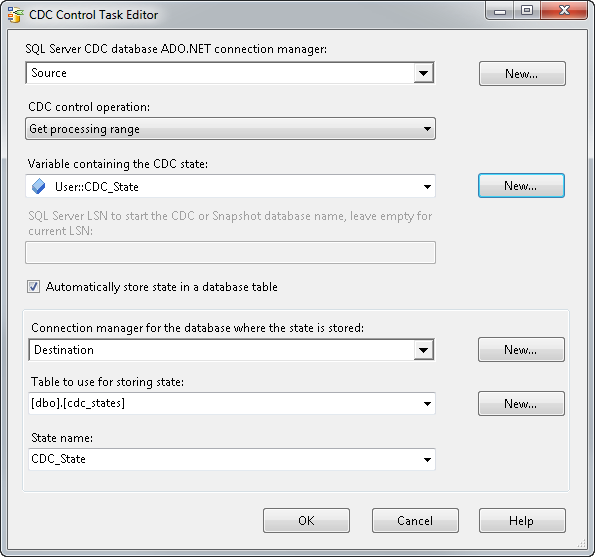 The CDC components in SQL 2012 work with SQL Server, and Oracle. 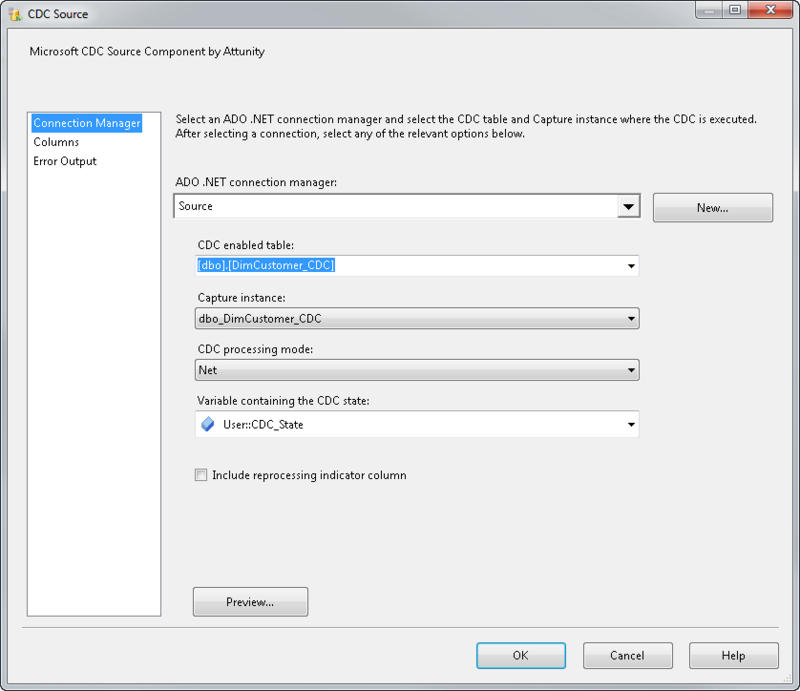 Attunity has a separate solution that works with DB2 (and other systems), but they are not part of the SQL 2012 license. I am a bit confused with the CDC for Oracle and how the architecture is supposed to look like in order to use packages like the ones described above. 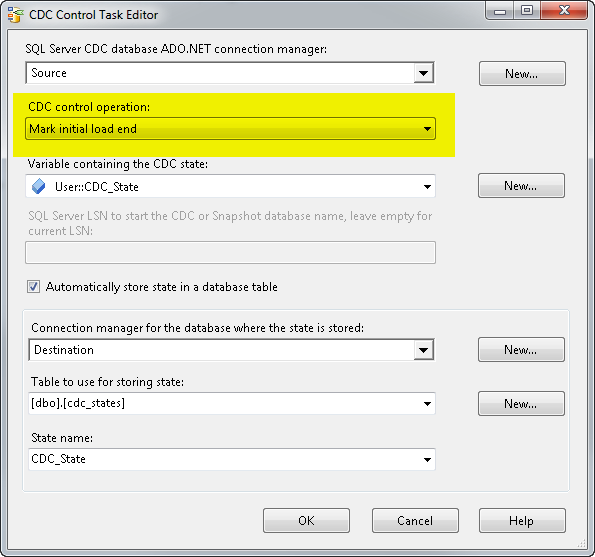 When I configure the CDC for Oracle, what happens on the SQL Server side? What more steps is that I need to take to have "everything" set up? IN SSIS I have implemented change data capture. I have made initial load and incremental load for the entire table which is related to data warehouse. Also made two master packages for initial and incremental. Initial consider as full load which would be loaded once and incremental loaded as per business require mental. I need some information related to risk and error handling or any other related information maintained of packages, how to send email notification do any have script??? Hi Matt, must say very nice walk through! I am newbie to SSIS so i had a little difficulty in understanding the two SQL tasks "Update & delete", whats the purpose of these tasks? I was walking through this and I get an error in the incremental part out of the CDCSource and get the following error. Error: 0x4002F304 at Certificate Partner, CDC Source : "Problems when trying to get changed records from dbo_certificate_partner. Reason – Incorrect syntax near the keyword 'CONVERT'..". This is the command the source is running. What I found is that it is trying to run against a DB that has compatibility mode of 80. I changed to 100 and it worked.Should I assume that it will not ever work against 80? I believe the CDC functionality was first introduced in SQL Server 2008 (DB version 100), so yes, I'd assume that that the SQL statements it generates assume a minimum level of compatibility. Does Backup routine affect CDC. Also does the DBA need to truncate the CDC schema tables as house keeping or does the Cleanup routine do this? We have got this going and its great, so thanks for your walk through. Now we want to wrap it up so that it is either complete success or complete failure with the incremental package so we can correct the error then run it again. When we set the package Transaction property to Required it fails on the end CDC control task in the package with no errors elsewhere. But I have question regarding if I want to do extract data from multiple tables and put into one table ,Is this possible? Sure – the only difference would that I think you'd want to track the state for each table separately (separate variables, separate sources, separate control tasks). You can control where the data ends up in your package logic. 1. After the initial load , I made an update for a single row in the source table.When I run the Incremental Load, there is no error shown , the package runs successfully without updating the destination table. 2. If I want to restart the process once again. I mean load the destination table using the initial load. Can I truncate the CDC_states table and start over again. The first time you run the incremental load package, it will check for any changes that were made while your "initial load" phase was done. If you insert rows after the initial load, you should see them appear the second time you run your incremental load package. Check the CDC API – I believe they have stored procedures which let you pause/reset CDC tracking on the table. Another option is to drop/recreate the CDC tables and run your initial load package again. Hi, is there any way to update CDC_State – CS value ? since it is keeping the the same value if i run the same package again , the newly inserted rows is getting inserted again in the destination. This is a great intro into the topic. I was wondering if there is any reason that using a single staging table with a CDCUpdateType field ( with values like 'I','D','U') would be a bad idea. Would you run into blocking issues? Because I can see that with the CDC splitter you need to have three separate output streams. Or do you think having three staging tables is better for the data transform parts of the ETL after the staging tables have been loaded? I don't see why a single staging table wouldn't work, provided you handle the operation code correctly. We have CDC enabled on our production Stage environment which receives replication rows from our source tables. 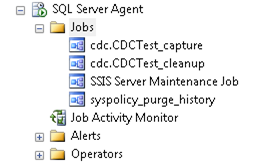 We also have a 2012 SSIS CDC package to mine the updates, inserts and deletes from the *_CT tables. We take these records and version them to our Data Store using the [cdc]. [lsn_time_mapping] table to determine the row change order. One issue we have not been able to resolve..
We have some user applications the business users use that retrieve and delete many rows. When exiting the app, it writes these rows back to the sever, even if this data did not change. Our CDC processing mode is set to NET so we see the _$operation 1's and 2's in the CDC table and SSIS processes these as a _$operation 5. How can cancel out the deletes and inserts when the insert matches what already in the table? HI Matt, Great article. 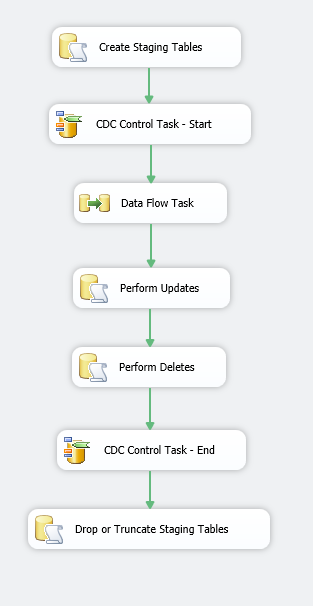 I implemented the CDC as per your direction using SSIS 2012. I came across a small issue. When I use ADO.net destination for UpdateOutput , it failed because I have a unique key constraint on of the columns.When I removed the constraint, the UpdateOutput dataflow inserted a new column in the destination table insted of updating the existing column in the destination. Please direct me how I can correct this issue. Can we select multiple tables in CDC SOurce.? 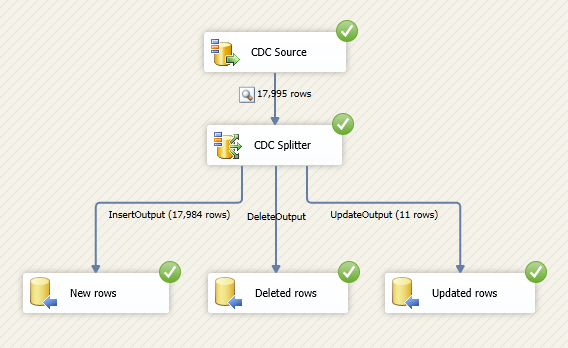 (4) CDC Data Flow:Error: SSIS Error Code DTS_E_PRIMEOUTPUTFAILED. The PrimeOutput method on CDC Source – Get Changes Since Last Sync LSN returned error code 0xC0047020. (3) CDC Data Flow:Error: "Problems when trying to get changed records from [TableName]. Reason – Exception from HRESULT: 0xC0047020.". to 2008 as source will i be able to use the same components. Yes, these components work against SQL Server 2008 as well. I have implemented the CDC on test enivornment,it is working as per expectation. but when I have implemented the same on DEV enivornment,intial load is working fine. but when i have started with incremental load CDC source task is not capturing the changes. I have checked source CT table ,it is capturing changes. also CDC state variable is also updating when i am running incremental packages. Hi matt, you seem to have errors in your data loading script lines 25 and 35? what is CustomerKey &lt; 500 supposed to mean? I tried to implement incremental ETL using CDC as explained by you. I added one row to source column it worked as expected.But when i m trying to run the same pkg again without making any change to source table.The row i added last time is again flowing through.since my target table is having primary key constraint.its failed. Ideally only rows changed from last run should flow through.am i missing any settings?can you please suggest what changes need to be done to handle this situation. This was literally the most useful and detailed tutorial I've ever followed. Everything is explained and I understand the SSIS CDC tasks a lot better now. I'm having one problem though…The second time I run the package it should have 0 rows but it does show the same rows as the first time. What am I missing? The CDC task flows are the same as in your tutorial (first is Get processing range, second is Mark processing range). Can you or anyone else here help me? I was wondering why you used ADO.NET instead of OLE DB? Is this common for working with CDC? IS there a way to use CDC for partial table/ Selected Columns? For example I have a table that has 50 columns. 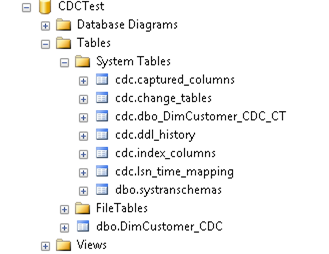 But i want to apply CDC for 10 columns which i will be needing for my destination table.